We advise you to only upload PDF documents. You may upload Word and Excel documents, but be advised these documents don't open by default on some mobile devices. Choose the method that best meets your needs. 1. Open the page you would like to edit. 2. Place your cursor where you would like to add text. 4. You can select an existing file from the Media Library or Upload a new file. 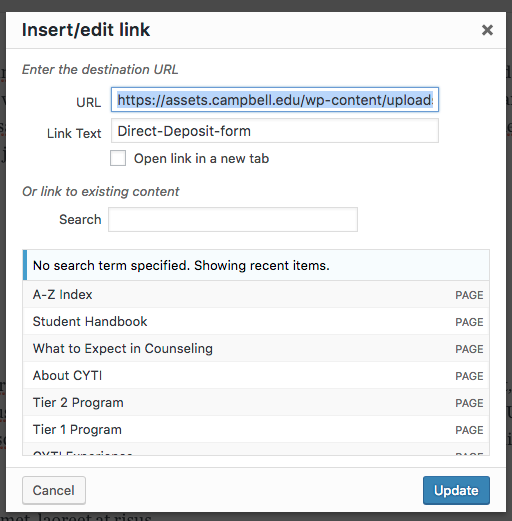 If you are uploading a new file, after upload remember to update the Title and select a category related to your school/department/program. 5. Click "Insert into Page" at bottom right. 6. The link to the PDF will be inserted into the page. If you do not edit your title, the link text will include the dashes or spaces used in the filename as the example above. 7. To modify the link, click anywhere in the link. An edit menu will appear. 8. Click the pencil icon to edit the link, then click the gear icon. 9. 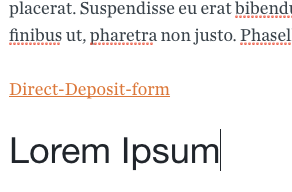 In the Insert/edit link window, you can edit the link text to appear as you would like it on the page as well as check a box to open the link in a new tab. 10. After making your updates, click Update. 11. Your page now has updated links. 1. Login to the your Campbell University website's Dashboard. 3. On the Upload New Media page, you can drag files to upload or click Select Files to find them on your computer. For this example, we will upload the file test.pdf. 4. Once your new files have uploaded, you will see the new file name and an edit link next to it. The preview of the uploaded document will appear in this view. It is a low-quality screenshot of the document, and will appear blurry. It's sole purpose is to help you easily identify what the first page of the document looks like. The URL field contains the full URL for the PDF. You can copy and use this link to create buttons to download your PDF. 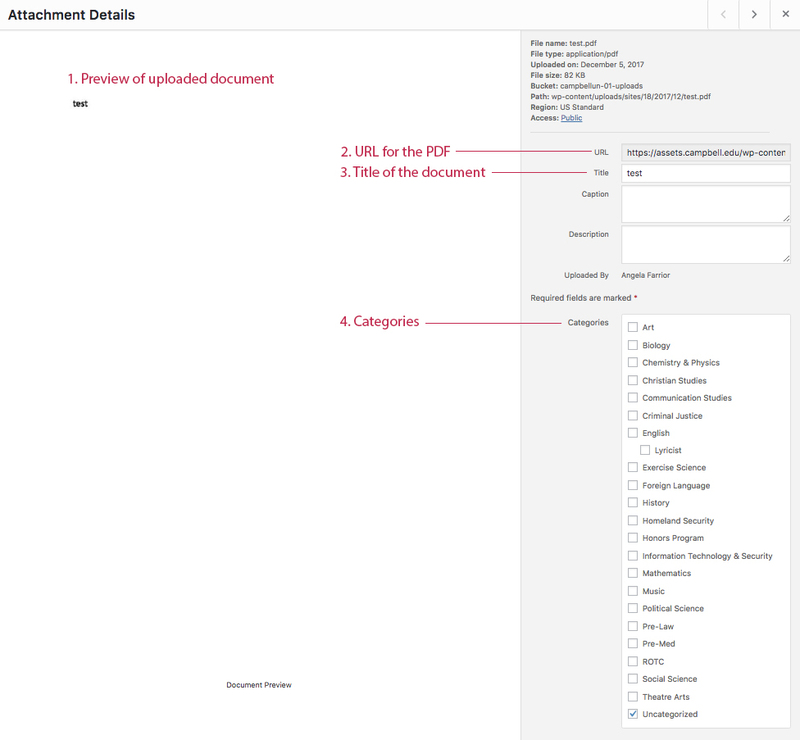 The Title field is important because it is a clear title for the document and will help you find your files more easily. The Categories are important to help you find your files by department/program.